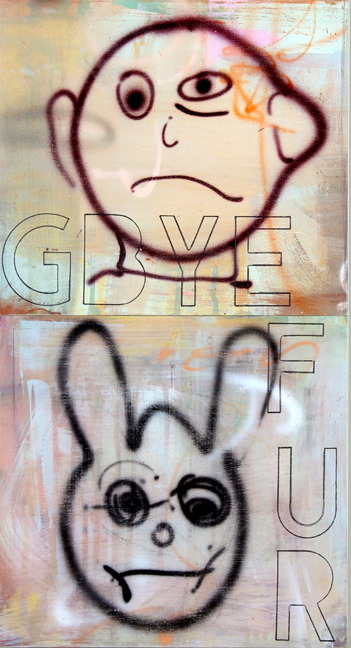 Gale Hart’s Show Some Emotion exhibition is where fine art, activism and a hint of graffiti collide. It produces great social commentary on topics such as our conditioned behaviors toward the mistreatment of animals, feminism, and gun control. Her artistic activism allows her to translate those messages into a visual language which conveys a great impact on her audience. 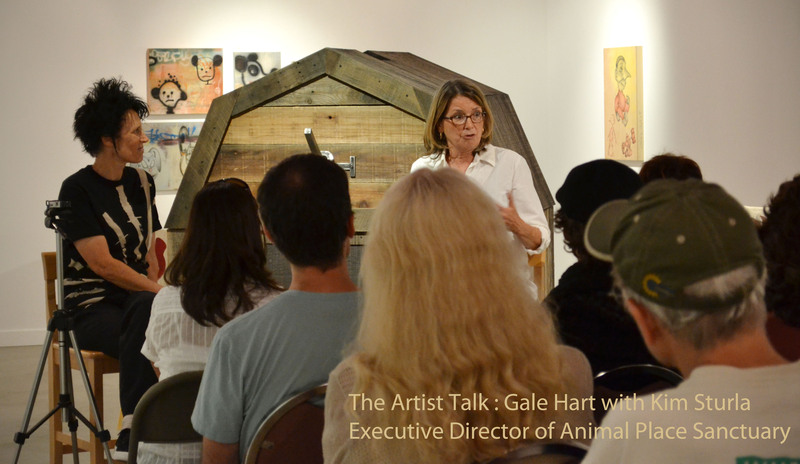 This month The Sacramento Art History Consortium had the opportunity to sit down and meet with Gale at her studio and attend her artist talk at Elliott Fouts Gallery, it is from those gatherings that this interview was formulated. If you haven’t had the opportunity to view the show it runs through October 4th at the Elliott Fouts Gallery in Sacramento. Gale how long have you been creating art, and working as an artist here in Sacramento? 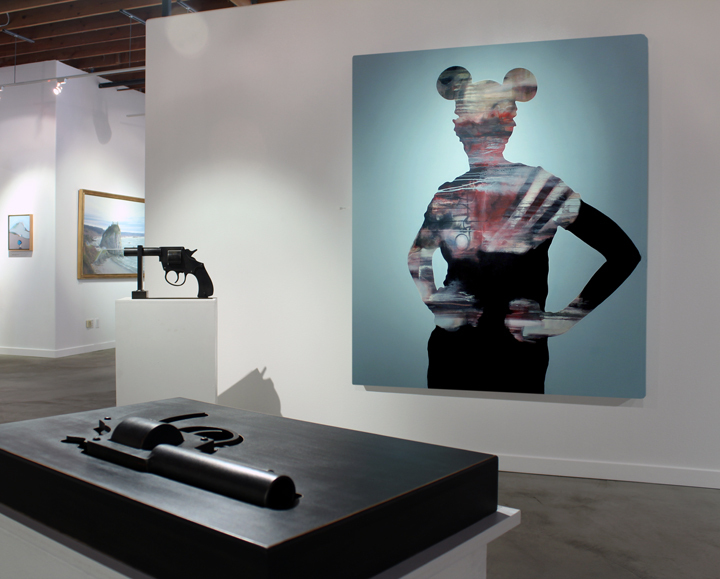 Your work sets out to impart a specific idea, and address many of today’s social concerns can you discuss the significance of you current exhibition? Show Some Emotion is a way to speak to others and call out the atrocities without being on a soap box. Personally, I strive to do as little harm as possible especially to animals. The apathy towards the treatment of innocent creatures and the participation in the process of using them is beyond my comprehension. I have a difficult time tolerating people choosing to participate in our cruel system with regard to animals. This is not the only social issue that gets under my skin; women still struggle so I like to address women’s empowerment in my work. 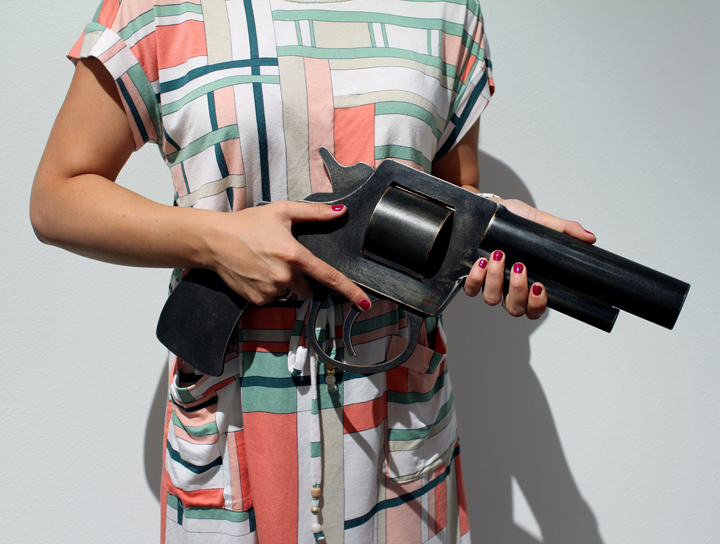 In this exhibit I also commented on guns in our society, not to choose a side but to state a fact: Close to half of gun fatalities are from accidents. How did you come up with the concept and the exploration of apathy? Is there one specific work in the show that you feel is a statement piece, one which encompasses your artistic vision and the significance of your message? 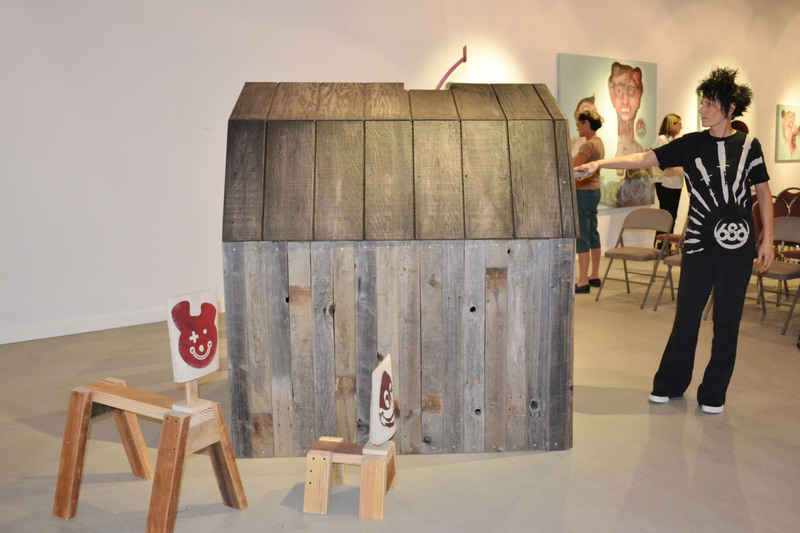 Would you Could you Should you (Installation) is a replica or a traditional old barn. The kind you would see driving in the country that may make you feel warm or nostalgic or maybe just enchanted with its architecture. There are no windows and the door cannot be opened. 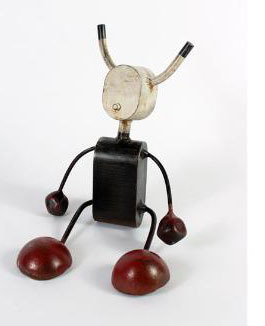 Around it are animals that are made out of saw horses that have feed sacks for heads. They have mostly happy expressions on their faces, one looks surprised. They are gathered around the barn. There is a lever on the front of the barn that the viewer is asked to pull down. When you give it a good pull it makes a thud sound and a feeling you have hit something and then a sign pops out the roof that says OW! The message is pretty clear. We hide the cruelty of the killing of animals for food. We deny our participation by not looking at it or refusing to see. We tell ourselves it is normal and natural to harm, cows, chickens and pigs while we have disdain for abuse to dogs and cats. If one allows themselves to fully experience the installation then they can imagine the act of taking a life and the painful reaction of the animal victim. Some people don’t have to imagine and have a more immediate sense of dread after pulling the handle. I have wanted to give people the experience of the kill for a long time without being graphic. I thought if it was subtle and to the point it would have a greater effect; but I am not opposed to taking the piece in a darker direction at some point. I do prefer sarcasm and humor over graphic images though. 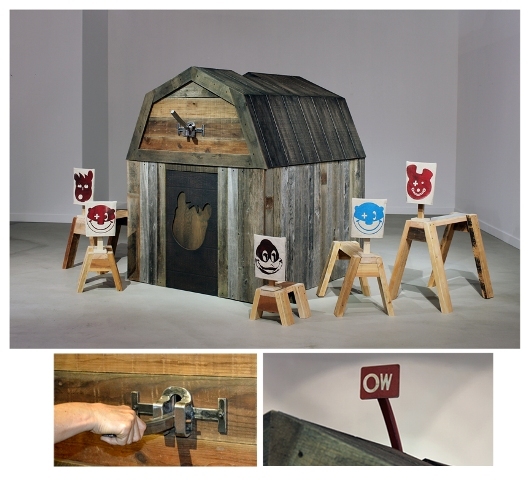 A portion of your exhibition focuses on how animals are perceived and treated; for example in the series of wood painted panels you use animals and text which pertains to how society may see animals a resource or as a commodity, can you expand on the impact of artistic activism and how you are trying to change that perception? It seems in western society we are obsessionally driven by money and success. Most of us are, or at some point have been willing to use another person or animal to get something we wanted. Our focus generally is outside of ourselves to obtain happiness and I think that leads us to objectify each other and animals. We are morally stunted because we make choices to do harm instead of finding ways to support one another, nature and the animal kingdom. Extermination and disregard are normal ways to treat animals and some people. Living animal beings are referred to as “its” not only is it an incorrect use of the word but it helps us keep the notion in place that animals are a commodity and not a living being with feelings, needs and a desire to live. As an activist I just look for ways to bring awareness in creative ways to the viewer. We are very brain washed so that is a big challenge, as well as our apathy and belief that we were given animals to do what we want to them. 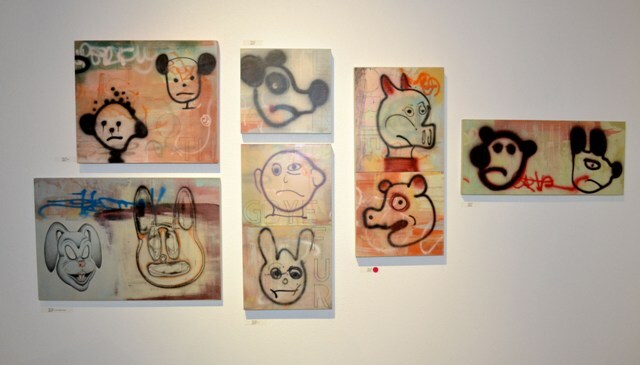 There is reference to very familiar imagery in your works; such as in Mickey Stop and the Power of Minnie, can you explain the juxtaposition between the subject matter and such familiar animal characterizations? Mickey has a lot of meaning to me. I think all the historical drawing and deviations of Mickey are some of the best illustrated cartoons to date. Mickey represents a man’s wonderful dream, to build an empire of entertainment. Mickey is the epitome of capitalism. Watching the growth of the Disney industry during my lifetime has been impressive, but ultimately it is a corporate giant. Mickey’s ears are recognizable throughout the world so when I use them the viewer immediately can feel familiar with the piece. There are a lot of copyright rules that say I cannot use Mickey Mouse; but he is so familiar using him is almost equal to using a tree. Mickey is kind of “ours” and I feel he is mine in a sense. I have a personal kinship with him. Some people do not think I should take such ownership over him and dislike it when I dismember Disney characters for the purpose of politics; but that just makes Mickey that must more meaningful and appealing to use. Mickey Stop and the The Power of Minnie are women empowerment statements. Mickey Stop is a look into the last few decades of the feminist movement. Women are now able to say no to domestic violence and discrimination. The Power of Minnie is a woman who is living a life of integrity, self-love and empowerment with a bit of attitude. Using Minnie Mouse ears in the works brings a timeline to the history of the women’s movement. In Minnie’s lifetime so much has taken place with regard to women struggling for equality. So many of our older cartoons were racist and sexist; I remember lots of Minnie cartoons were she was in trouble, needed to be saved and Mickey would rescue her. I have taken her out of that dependent role. Have you started developing a concept for your next exhibition? 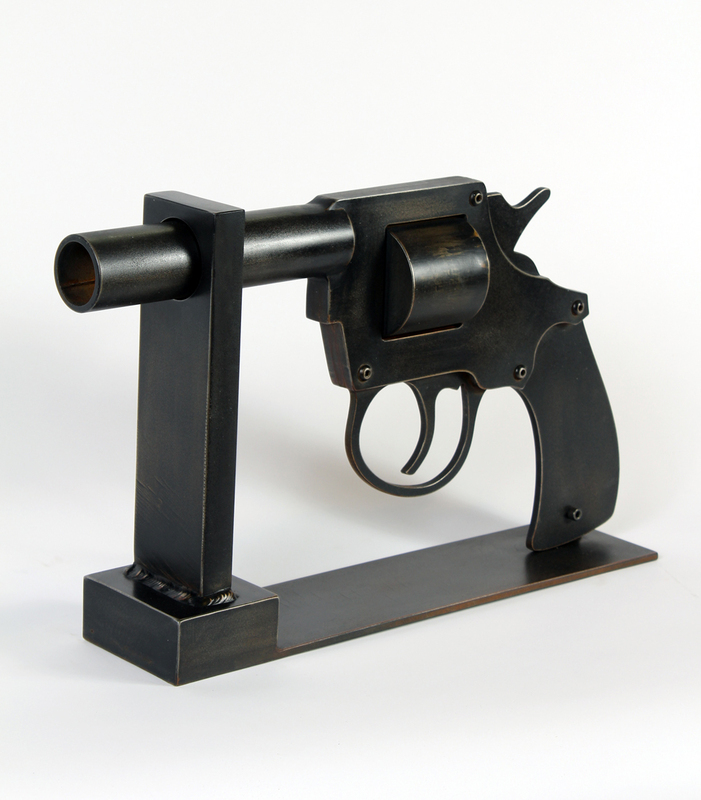 I am not planning another show yet, but the gun sculptures In Plain Sight and Just in Case have got some interest from others and even some on my part so I may explore it some more. 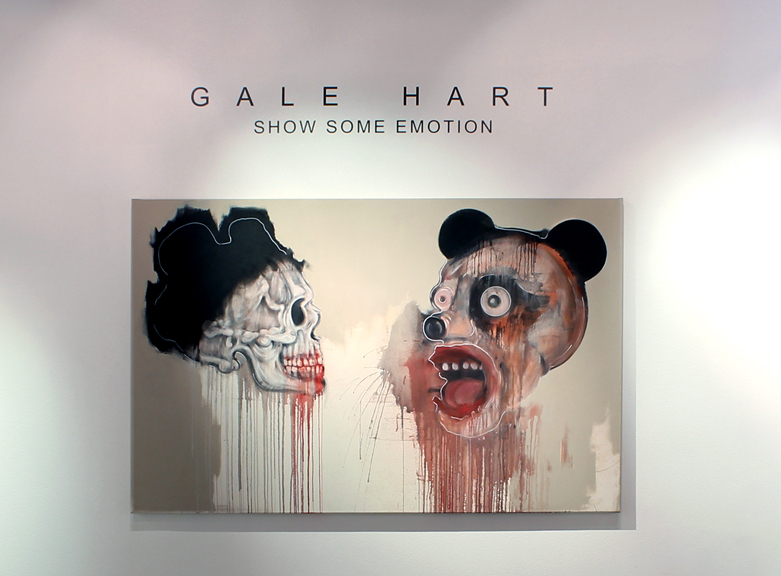 Is there anything that you would like the public to know about Gale Hart? That having my talent is not as easy as it looks. I struggle with putting so much activism in my work when I could choose a path and make art that matches couches and decors. I divide art in to two categories, art that is meant for our souls and art that is meant for our walls. I can do either but feel empty when I do art for walls. Maybe because I am just more interested in tearing walls down!